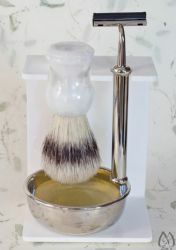 Nickel and acrylic five piece shaving set comes with white pearl design handle boar brush. Includes nickel handle razor in choice of TracII or Mach3 cartridge, nickel palm bowl, Em's "Outdoors" glycerin round and white acrylic holder. Everything you need to get started.